Sebastian Bach was a devout Lutheran, true, but he wrote Jewish music. I do not say this simply to embellish the repute of my ancestral people. The nation Israel needs no trills. I say this after long years of study and performance of Bach’s music, during which I have come to know this remarkable man. Better, I hazard to say, than his own sons did. What is Jewish about the music? To see that, you have to know music. Which, of course you know. You also have to know what Judaism is. Which, thanks to my niece, you do not. This is scandalous. The grandson of the great Moses Mendelssohn knows nothing of his own people’s special relationship with God. Or I should say, he knows what every self-satisfied Prussian burgher knows, which is that the God of the Old Testament is harsh and vindictive and that his erstwhile people have hopelessly lost their way in a tangle of laws and observances in which the King of Heaven himself long ago lost interest. When you’ve had enough of tugging at those curls of yours you might play movement three, the Courante, once more. It’s your favorite? I am not surprised. It’s so jumpy and exuberant that I think Bach must have been feeling seventeen when he wrote it. No, he was in his 40s. But he was as exuberant as a young man. Not so fast. Pay attention to what you are doing here. In these measures. Seven through nine. Do you hear what you have done? That hint of emphasis here, and again here? Now isn’t that Jewish? You’re asking yourself, what does this crazy old lady want of me? Oh yes, I see it in your eyes. Don’t deny it. Great aunts know. Now you’ve got me smirking as well. Look. How many measures in this first section? Yes, 32. And how many phrases. Four, very good. How many measures per phrase? Come now. Four into 32. Eight. Eight measures per phrase? Isn’t that what the rules would require? 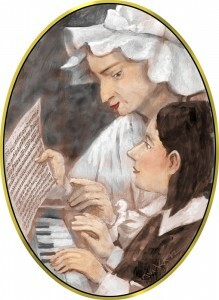 Bach, after all, is baroque. Baroque means very strict rules. Everything is very regular, very predictable. That’s what everyone says. That’s why they don’t want to listen to this music. Why listen to something so banal when you can listen to Ludwig Beethoven put his diarrhea into demisemiquavers? Excuse me. But you know what I mean. If there are 32 measures and four phrases, there must be eight measures in each phrase. So unexciting. So where does the first phrase end? Look at the chords. Very good. On this G. The first note of the ninth measure. Not the last note of the eighth measure, but that’s close enough, don’t you think? So your right hand should immediate pick up the melody of the second phrase after that G. Except. So what is your right hand doing at that point? Don’t you see? It started the new melodic phrase a measure before. E-F-D-A-D-F-D, the motive repeated here in measure ten but one note down, D-F-C-G-C-E-C. So is Bach obeying the rules or breaking them? Some day you might read your grandfather’s books. If you can find them, because I understand that your mother and father have made your house Judenrein and that one cannot find anything prior to the Gospels on the shelves here. But perhaps they have copies hidden away in some secret corner. If so, you will find that Moses our teacher received two types of laws from our Creator. There is the written law and the oral law. The written law is what you see in the Five Books of Moses and the Oral Law is the supplementary material and interpretations handed down by our Sages. In each generation the Sages are authorized—indeed required—to understand the law in accordance with the needs of the moment and to rule accordingly. No, this is not antinomianism. The law is fundamental. But the law is not a single note that never changes. It is a melodic line that flows from the tonic and returns to it inexorably in the end. If Bach were to have taken his 32-measure “A” section and divided it neatly into four eight-measure phrases, he would have been meek and law-abiding and boring. But our lives are not boring, or at least they should not be if we truly experience God, if we love those close to us, if we marvel at the world around us. All these things were created and are maintained by divine and natural law, but none of them are dull. Nowadays, in this time when people think they are so modern, composers simply cast off all discipline and write what is in their hearts, they say, although I believe it often comes from their colons. They write overtures and fantasias and serenades and meditations but they, like your mother and father, take the easy way out. What emerges is bland, amorphous, unworthy of music’s high calling. I first performed this Partita at Rahel Varnhagen’s salon, I believe it was some time in the 1790s when the world was aflame. In preparing the piece for a public concert I initially had difficulty with the Courante. Friedmann Bach had taught me to stress phrase boundaries but here I could not see where the stress could go. I consulted with him and he was rather dismissive: “The old man couldn’t make up his mind,” he said. I kept working on the piece and the morning prior to the performance I had my epiphany. Here, let me play it for you. So where is the stress? Yes, here. And here too. At the end of the melodic line. And at the end of the harmonic progression. Which do not coincide. You see, the underlying harmonics here are the Torah, the Written Law. And the melody playing above it is the Oral Law. The melody would be hollow, meaningless without the underlying harmony, and the underlying harmony would be incomplete and useless without the melody above it. The simple-minded might think that the two laws should coincide. What good is a God if his message is not clear? Yet it is the lack of clarity, the occasional dissonance, the unsynchronized phrases that move us forward, that propel us toward the final resolution. And that final tonic itself sends us off into new melodic and harmonic firmaments, from which we again return to our G major chord. One idea begins before the previous idea has been completed. As when you interrupt your Great Aunt Sara. Well, I’m glad that excites you. Because I heard the elision of those phrases in your fingers when you played the piece through for me. Oh, yes I did. That is why I said you play like a Jew. I seldom need to correct great-nephew Felix’s technique. But I do need to help him understand why he plays as he does. What’s that? Why can’t you enunciate? Sebastian Bach is what? “Cool?” Is that how you young people speak today? Fine, let him be “cool.” Oh yes, I’ve got a whole library of scores and parts that you can study. Just come and pay your great aunt a visit. Remind me to show you the “St. Matthew Passion.” It is such wonderfully Jewish music!